but it was not raining rain drops. “Jack went swimming in it. It was very sticky in the chocolate. I’m not sure what captivated me about the book – probably the singsong repetitiveness of the text, but mainly of course, the subject matter. (it’s now sadly out of print). 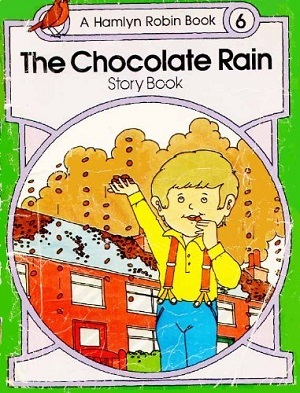 Thinking about how so much of children’s literature is dependent on food; the Famous Five and their ginger beer picnics, midnight feasts at boarding schools, and the Mad Hatter’s Tea Party, it’s baffling that there aren’t more chocolate books. 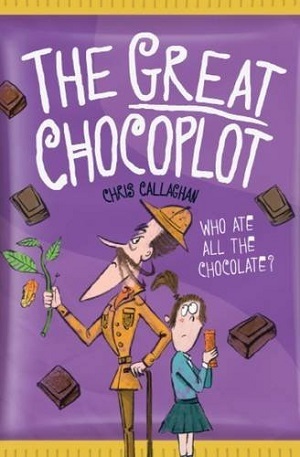 Of course there’s the dominant Charlie and the Chocolate Factory by Roald Dahl, which I won’t review, as I’m sure you’ve ALL consumed more than your fair share of Willy Wonka’s magic, but now, there’s also The Great Chocoplot by Chris Callaghan, with its shiny purple cover. Jelly and her chocolate-obsessed parents live in a town with a chocolate factory (no, not that one!). Everyone loves eating chocolate – they eat it all the time in fact, especially Blocka Choca bars. And everyone depends on the chocolate industry. Then a news report announces that according to an ancient prophesy on Easter Egg Island, there will be a chocopocalypse in six days, resulting in no more chocolate…ever! Jelly notices something strange about the ‘posh’ chocolate shop in town, which sells horrid chocolate, and is run by Garibaldi Chocolati, who doesn’t seem perturbed about the coming meltdown. Together with her Gran (who lives in the caravan on Jelly’s driveway), Jelly sets off to investigate if there is a chocopocalypse or just an evil chocoplot. Chris Callaghan has captured the silliness and craziness of his idea (subtitle Who Ate All the Chocolate? ), jam-sandwiching it with modern sensibilities – Jelly downloads an app to countdown to the chocopocalypse, uses text messages to communicate, and foils dastardly plans with satnav. But despite the eccentric villain, crackpot characters, and a host of fun, there is a hint of seriousness behind the book. There are underlying messages about the impending doom when a town dependent on one product is faced with its extinction. Jelly is particularly concerned about how tired her mother is from working nights at the supermarket, and the economy of the town. And under the glitzy wrapper of shiny gloss there is a tiny dark hint of being over-reliant on something for happiness. “’Eat it! Eat it!’ yelled Mum and Dad together. It did the trick though, with the glossy purple cover winking at me, and the inevitable descriptions of people constantly eating chocolate, by the end I was desperate for my own “meltilicious chocodreaminess”. If this is anything to go by, this debut novelist will have us all eating out of his hand. Age 7+ years. You can taste it here. 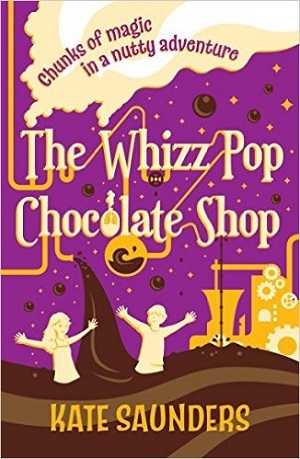 Of course the inimitable Kate Saunders wrote The Whizz Pop Chocolate Shop some time ago, which is also well worth dipping into. Twins Oz and Lily have inherited an ancient chocolate shop and are moving in. But of course it’s not that simple, and soon the twins become involved in ancient family history –which just happens to be of the magical sort – with witches and wizards galore, and a Secret Ministry of the Unexplained in an undercover world. There’s a cast of eccentrics, which includes a talking rat and a helpful cat called Demerara (a favourite of mine, not just because of the name, but also its penchant for glitter). It turns out chocolate is pretty special, the moulds holding the secret to immortality. And of course there’s some villainy too. This is a magical mix of spy genre, adventure, mystery, and good old-fashioned British eccentricity, with a healthy dose of a girl with dyslexia saving the day. With so many elements and a twisty plot, the book isn’t smooth chocolate, but a nice nutty mix of crunch, richness, gloss and sweetness, and there’s no surprise that the cover of this one too, is that famous shiny purple. Age 9+ years. You can buy it here.